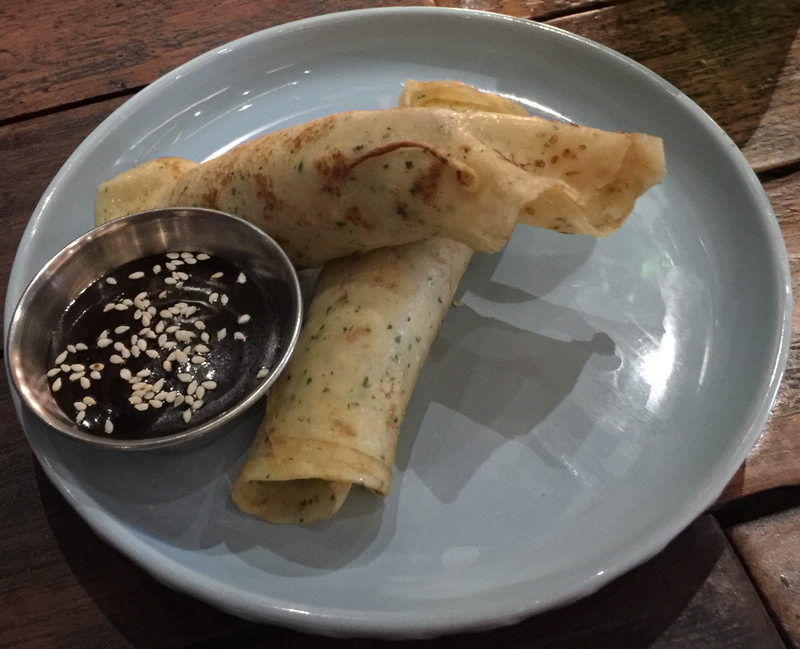 Located in a little cobblestone lane in a suburb of Canberra is a Nepalese restaurant. I wanted to try eating there as I had not eaten Nepalese food before and as it was a friends birthday we decided to celebrate here. It’s a quaint little restaurant which is quite nicely decorated inside. There was only one other couple dining when I arrived and when they left only one other arrived, so a quiet night for a Wednesday at this restaurant. As their website says…Chomolungma is Tibetan and means ‘The Goddess Mother of Mountains’ and refers to Mount Everest. When my friend arrived, we ordered some Roti bread [which was pan fried and tossed with ghee] and a main course each. We decided not to share as my friend wanted to order a meat dish and of course I only eat vegetarian food. We were given complimentary pappadams before our meal arrived which were great to suppress our hunger as neither of us had time for lunch that day. Then pretty much straight after that our meals arrived. I also ordered white rice and a mango pickle dish. Our waitress told us that Nepalese food is influenced by the Tibetan cuisines from the North and Indian from the south which makes extensive use of spices like cumin, Himalayan pepper, chillies, garlic, coriander and many other spices. I must say with my meal I didn’t find there were enough spices and my friend said the same about her dish. My dish was the green beans, potatoes cooked with tomatoes, onion and garlic which was nice but I just thought it needed a bit of spice to liven it up. After our main courses were served, our waitress told us a little bit about the chef who was born in Nepal who when he was growing up had an interest in how his meals were prepared by his mother. This interest then led the chef to commence work in the hospitality industry in 1996 in Nepal and is now an expert in Nepali cuisine. Something interesting I learnt about the restaurant is that if you order the Nepali Thali which is a meat or vegetarian meal made up of a selection of dishes, it comes in a tray with little dishes. Really Thali means a round platter used to serve food and that is exactly how the meal is served. The idea behind a Thali is to offer six different flavours of sweet, salt, bitter, sour, astringent and spicy on one single plate. The plates looked great. I wish I had ordered this!! Lovely night, probably would return just to try some other dishes, especially the Thali. A few years ago a group of my lovely friends and I travelled to Queensland which is the northern part of Australia for a long weekend in a beach side town called Noosa. We used to try and meet up once a year to catch up as we all live in different parts of Australia and it was a good reason to spend some times together. Tracey, one of my friends leased a beautiful home on the canals of Noosa. We all arrived on a Friday and I flew in from Canberra and drove up with my friend Sandy who lives about an hour away. The home we stayed in was absolutely beautiful and we spent most of our time on the back patio which has a huge and comfortable lounge, BBQ and large table and chairs for us to eat our meals. It even had a lap pool, but none of were swimming that weekend; too much food and wine and gossiping to be had. As were the views at night…. But I must say whilst it was incredibly boring walking around with the girls, there were very lovely views across the course with blossoming trees and ponds with lilies. Back at the house, my friends made lovely food over the weekend; mostly on the BBQ with salads and fresh breads and lovely cheese and biscuits. And Noosa not only has lovely canals but some very lovely beaches which we walked along one morning. A wonderful time away with friends!! What I think is the best Thai food I have had in years!! I had never heard of this restaurant in Canberra until a friend of mine invited me to dinner one evening. It’s in the centre of Canberra along the main street [for those of you who do not know Canberra it’s a pretty small main street but has several nice restaurants and a large shopping centre]. My two friends decided they would order a vegetarian dish so that we could all share and I am so glad as there were such fabulous dishes on the menu. To start we shared the deep fried eggplant which was amazing…I think I order eggplant at any time I can when I go out I love it so much. Then we ordered the tofu, egg and pumpkin curry with greens and also the stir fried chilli green peppercorn eggplant with green beans and chilli – I am so lucky my friends are also lovers of eggplant so I got to share more than one eggplant dish!!! 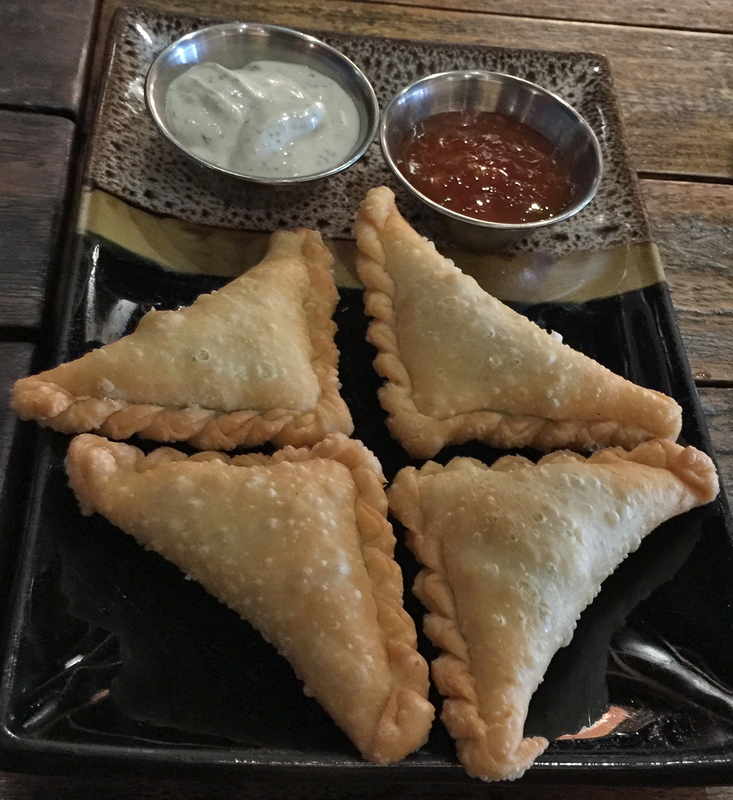 The food at this restaurant is so good that I went again today and my friend and I ordered the curry puffs to share for entrée, whilst my other friend ordered the duck pancakes; which he loved. Then for main course, as I had told these particular friends about the deep friend eggplant dish and the pumpkin curry dish and told them how delicious they were, they both wanted to try them. 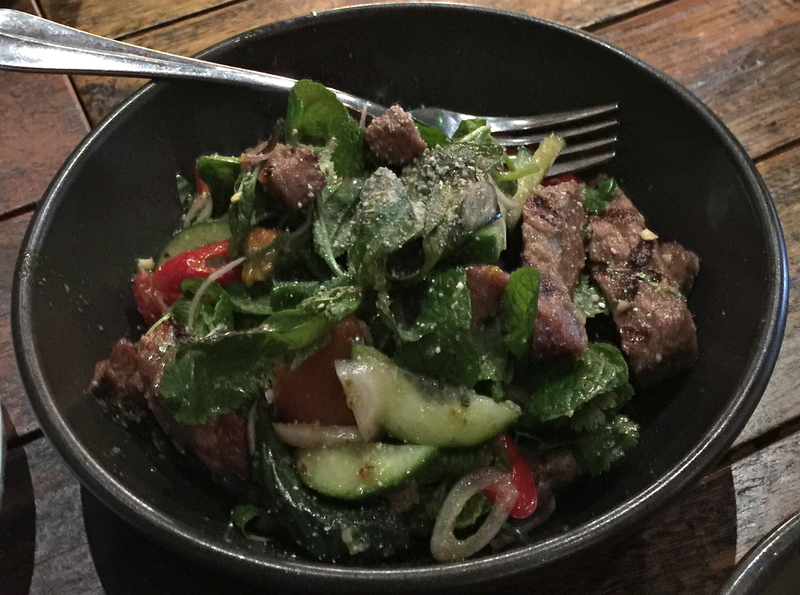 So that’s what we ordered to share and my friends also ordered the Crying Tiger Salad which is Wagu beef with stir fried mixed vegetables and a Thai dipping sauce called Nam Jim Jaew. They both told me that was a really tasty dish. Such fabulous food!! On the way to our cars, I saw a couple I used to work with in Beijing and funnily enough they were asking about a good Thai restaurant in Canberra so I was able to honestly tell them about this great restaurant. I am sure I will be back!! Ritan Park [the Temple of the Sun] is located in Chaoyang District, about a forty-five minute walk from my apartment block. One day on the way to lunch my friend and I decided to take a walk through the park as it was such a lovely day. We saw an entrance fee of 1 RMB (about 20 cents AUD) but for some reason we were allowed to enter without a fee. The park covers an area of 206,200 square metres, but we only walked the distance from the front gate to the back. Along the way we saw the royal shrine which was built in 1530 and used by Ming and Qing Emperors to make sacrifices to the sun. The park is really lovely and another one of Beijing’s parks where you can see the elderly Chinese practising t’ai chi, playing Mahjong or walking around the ponds with their grandchildren; flying kites. We were lucky to be able to see the blossoms on the many trees within the park; such a lovely sight. There is a wonderful Chinese restaurant in the park which I have eaten at a couple of times before with a rooftop area to sit and overlook the park. There is also a cafe called the ‘Stone Boat Café’ where you can sit either inside or out, overlooking the water; enjoying a cup of Chinese tea and some Chinese snacks. My friend and I strolled throughout the park speaking to the local Chinese, taking photographs, looking at the flowers and trees and generally just enjoyed a spring day in Beijing. A lovely hour or so and well worth the time when in Beijing. So…we are in our last day in Guizhou Province and we still have a few places to visit which means this post I am going to cover three different places and a lunch so hope it’s not too long to read. Our first stop is to Wanfenglin Scenic Area in Xingyi which is southwest of the capital Guiyang and is very much a karst mountain region which takes up about 2000 square kilometres of Xingyi. Wanfenglin is also known as the Forest of Ten Thousand Peaks and you can see why when you are here you will find the majority of China’s cone karst mountains. Cone karst mountains are very similar to those found in Yangshuo in Guangxi Zhuang Autonomous Region (another amazing place in China). Both were created through the same process of slowly-dissolving limestone giving way to cone-shaped mini-mountains. When we arrived at Wanfenglin, we took advantage of the safari buggies traveling along the high road which is about 100 metres above the valley floor, otherwise it’s a very long walk around the township. The predominant minority living here are the Buyi (布依), who are related to the Zhuang (壮) —the largest minority group in China. Older architecture in the area is made from rough-cut local limestone with slate or tile roofs and our guide showed us the oldest home in the township. It’s a shame really that there are not many of the older homes left as they are wonderful to see but the traditional homes are being replaced by more modern country homes made with ceramic tiles. I think the ride took us around forty-minutes and it was great to see the different karst peaks as the whole area is like a set from a movie. It was great to see the locals walking around and my two friends and I tried to take photos out of the moving but but it was very difficult. The crop fields were also wonderful to see from above; they change during the different seasons; all different shades of green, brown and yellow when we visited – just beautiful and magical. Our next stop was to Dragon Palace Cave in Anshun where we took a walk alongside a little river before taking a little motorised boat into the caves. It is said that these caves are the home of the mythological Dragon King and got their name because of its resemblance to the Dragon King’s palace described in one of China’s most influential novels, ‘Journey to the West’. Before entering the cave, you walk along a lovely little stone bridge which has stone dragons on either side. Also at the area of the bridge was a lovely waterfall which our guide said the locals describe as a white dragon leaving its cave and is named the Dragon Gate Fall – it’s lovely!! We then hopped onto a little mortised boat and travelled into the mouth of the caves. Our guide advised us that this is the longest underground river in China, some 5,000 metres long and flows beneath more than thirty hills connecting over ninety limestone caves. Inside there is a waterfall, along with stalactite and stalagmite formations which are lit up with different colours – it was pretty but probably not one of the best places I have visited in China. We then knew we had to have lunch as were were very hungry so we stopped at a little shop with a wonderful Chinese woman who made us some noodles and dumplings; too much food but it was sensational. Whilst the owner cooked our noodles we selected toppings including chilli/onions/beef (for my friends) and vinegar and my friend Jo went to look for some cold drinks; which she found and brought back for us. I asked for vegetarian dumplings and my friends had the meat – all made in front of us on a tiny little bench then popped into boiling water to cook. Of course my eyes were bigger than my belly and I ended up giving my dumplings to our driver and tour guide; which they appreciated. And as we left we gave the owner a little furry koala as a gift which she told us she was going to give to her grandchild; another person who was very appreciative!! After our lunch we had one more place to visit before going to the airport – Jiaxiu Tower in downtown Guiyang. We did not have much time but wanted to see the tower so the driver dropped us off up the road and we walked very quickly to the area where the tower is located and along the way saw locals selling different types of fruit and lovely blossoming trees. Jiaxiu Tower is a landmark of Guiyang and is known as the First Scholar’s Tower. It was originally built in 1598 to encourage intellectuals to study for imperial examinations. It’s a three-storey tower twenty-metres high. We didn’t, unfortunately, have time to go into the tower but it was lovely to see from outside. After a very long day we head to the airport to make our way back to Beijing. A fabulous province that I genuinely enjoyed. Sharing plates is the new thing to do at restaurants these days which is great as it’s nice to be able to taste lots of different items on the menu. So with that in mind, I had friends visiting from the south coast of New South Wales and they are ‘foodies’ so we decided on a restaurant where most of the dishes are for sharing which suited us all. We chose ‘Temporada’ as it has a lovely laid back atmosphere and open eatery and also it’s also one of the newer restaurants. When we arrived we were seated at the end of a large communal table which was quite lovely and casual. The only male in our group ordered a boutique beer and us three girls ordered a lovely bottle of French Sauvignon Blanc to share. The restaurant is in the centre of Canberra and about a ten minute drive from my home, but on this occasion I decided to walk in and it took me exactly fifty-eight minutes; bit cold but I was rugged up. The menu at Temporada is extensive [for meat and fish eaters] and we all started off with house made sourdough bread with cultured butter followed by a huge plate of kipfler potatoes with gremolata which we all tasted and found delicious. My friends also ordered the chicken and leek terrine with crispy chicken skin salad and chestnuts, the marinated sardines on toast topped with cherry tomatoes and parsley and the spiced lamb cigars with sumac yoghurt. All non-vegetarian dishes were tasty as told by my friends. My friends then ordered a few more dishes to share so back to the menu they went and ordered the black pudding with pickled chilli topped with crumbed artichokes and the BBQ king prawns with basil and mayonnaise. One of my friends told me that the crumbed artichokes were really good so she kindly asked the waiter to have the dish made without the black pudding; which the chef did – and I must say the artichokes really were good!! Then my hungry and thirsty friends and I ordered more wine and beer; followed by our main courses. I ordered the herb and garlic gnocchi which came with zucchini and [way too much] pepita cream whilst my friends ordered two mains consisting of the grilled jurassic quail with pumpkin, sage and speck, which I learnt was a pork fat and certainly not my ‘cup of tea’ but my friends liked it, and finally the the grilled bungalow pork cutlet with black garlic and apple. We were all so very full by this stage, but still thirsty so ordered more drinks then asked to see the dessert menu just in case there was something delicious on there; there was!! We ordered the banana, hazelnut parfait with rum soaked dates, the caramelised white chocolate mousse with strawberries and brik pastry AND the chocolate ganache, liquorice custard with mandarin sorbet. I look back on what we all ate that night and it was so much, I must say I was glad I made the effort to walk into town and whilst there was not much vegetarian choice I did consume lots of lovely French wine and the company of my friends made for a lovely evening! !